The final game of the season, a fine spring morning at Groombridge, one point needed to be sure of winning the title outright - everything was set up for an epic day. Riverhead had arrived a full hour early, intent on spoiling the Falcons’ party (to quote a Falcons parent, “that’s not very nice, is it...”). 2 mins - corner from Harry, just over the bar from Max. 4 mins - another Falcons corner, scrambled away. 6 mins - free-kick 25 yards out, hit sweetly by Harvey, inside of post and somehow bounced out rather than in. 7 mins - another Harvey free-kick, this time caught by the keeper. 9 mins - free-kick for Riverhead just outside the box, well fielded by Dan. 11 mins - free-kick from Harry, slipped to Max, great shot hits the bar and grabbed by the keeper. 13 mins - firm shot from Joey well saved. 17 mins - Harry and Luke combine well down the left, feed Ben who nearly gets in on the keeper. A very physical game. The Falcons were dominating and could easily have been three goals up, but Riverhead still carried an obvious threat on the break. 21 mins - Luke feeds Ben again 20 yards out, but Ben’s superb strike hits the bar. 26 mins - another free-kick from Harvey, well fielded by the keeper. 30 mins - short corner, Harry to Josh, lovely strike from Josh, keeper can only push it away, on to Max’s head, keeper tips it over the bar. 31 mins - another corner, this time just over the bar. 34 mins - a Riverhead break down the left, ball deflects across the goal and the Riverhead striker looks clear on goal. Dan comes out, delays his dive and manages to block the shot. A crucial save that sees the Falcons reach half-time with a very well-deserved lead, albeit only 1-0. Half-time team talk - just keep playing like that and the title is yours. The second half started out in a slightly calmer manner, with the Falcons having the majority of the possession but being unable to create clear-cut chances. Then after 50 minutes, a throw from Luke down the right was flicked into the Riverhead box. Luca was quickest to react, bravely getting a foot in to loop the ball over the keeper and into the corner of the net. The Riverhead keeper was injured as he fell and sadly had to be taken off (thankfully just strained neck muscles and he’ll be fine in a few days). So 2-0, and 20 mins to go. Surely that would be enough for the Falcons. More pressure, a good move saw George through on goal but he couldn’t quite beat the keeper. At the back, Kaan was marshalling the defence with his trademark calm authority, Harvey was winning every tackle, and Dan B and Lewie were showing their usual mastery of breaking up play and overlapping to support the attack. In goal, Dan was calmly picking up everything that came his way. Then with five minutes to play, a contentious free-kick on the angle just outside the Falcons’ box. The ball deflected off the wall straight to a Riverhead forward who was left with a tap in. 2-1. A draw would have been enough, but this is the Falcons….of course they wanted to win the title in style. And sure enough, with minute to go Luca set off on a lovely run, cut in from the left, took it round the keeper and smacked the ball into the net. A great goal, and cue the celebrations. Final whistle: 3-1. So after the surprise of winning the title last season, the huge satisfaction of successfully defending the title. As defending champions, every team the Falcons played this season made sure they had their best team out and raised their game, so to win the title again is a massive achievement for the boys. And the stats speak for themselves: played 20, won 18, lost 2, goals for 84, goals against 8. A team that averages more than 4 goals a game and only lets in 8 goals in 20 games is a force of nature! Well done to a great group of boys and a fantastic team. This was a top of the table clash with a lot riding on the result, and therefore always going to be a nervous affair. A win for Langton Green would secure the 2016/17 league title, but as any football pundit would remind us “ getting over the line “ is never easy. The morning was cool, overcast – certainly not spectator weather - the pitch grassy, but firm and a little bobbly in places. And there was clear tension in the air, and the engagement of a referee and two qualified linesman highlighted the importance of the game, and only amplified the atmosphere. The first half started well for Langton with numerous runs at the opposition defence, but either the final pass went astray or Broad Oak managed to get in a timely last-minute tackle. But as the game progressed without a Langton goal, Broak Oak grew in confidence, and the momentum and possession swung in their direction. After around 20 minutes a quick Broad Oak throw-in along the left wing led to a ball slotted into the penalty box - the ball bounced kindly to the attacking player in front of goal, who thumped the ball past a helpless Dan. Langton responded immediately to going behind, but were unable to establish either controlled passages of play or indeed eke out clear cut chances in our normal manner. Several Langton corners flashed across the goal mouth, without any luck, and then when another Langton move forced the ball into the box, a slip by the defender looked like a case of handball - an appeal for a penalty was turned down - I’ve seen them given. It was clear as soon as the second half started that the Broad Oak tactics were going to be to hang onto their lead, and restrict Langton wherever possible. And defensively they remained strong, clearing the ball decisively when given the opportunity, and showing professionalism in slowing the game down. Langton continued to press and try to find a way through to goal, but clear-cut chances were few and far between. Langton must have had 80% possession in the last 10 minutes of the half, with corners and throw-ins galore, but to no avail. Full time – 1-0 to Broad Oak and only the second league loss of the season for the Falcons. The lads have their final game of the season on Sunday vs Riverhead, with one point needed to retain the league title. With only three games left of the season and needing three wins to be sure of becoming champions once again this year, it still surprises me how relaxed all the boys look when they start the game. On a hard, uneven pitch, Luke won the toss and decided to play into the strong breeze in the first half. The game started at a good pace and both teams looking dangerous either end of the pitch. The Langton midfield were again so strong, with Max holding the ball well and making the Tunbridge Wells boys very nervous. 10 minutes in and the game had picked up pace. When the pace picks up there is only one man who literally stays stuck in 6th gear!!!! Luke was everywhere, cutting out any opportunities the TW boys were making. Still there was a lot of pressure, and as we got to 15 minutes in, TW had a lovely through ball and a half decent shot on goal. Luckily it was wide. This sudden small shock caused the Falcons to apply the pressure; the boys put together some neat passing with some great runs down the line by Josh. There was a sudden break, a lovely cross by Luke straight to the feet of Joey, unfortunately saved by the keeper. Again the Falcons were taking the upper hand, with another run down the wing by Josh and a pass to Luca, who had a great shot, again saved by the keeper. This keeper was definitely keeping the TW boys in the game. As half time approached, TW had a break, the striker hit a sweet lob that looked destined for the net, but Dan managed to tip it onto the crossbar and out to safety. The Falcons had made it to half time on level terms and would have the wind at their backs in the second half. Those Jaffa cakes really do the trick!! The Falcons came out hungry and it wasn’t long before a lovely run and pass back from Josh found Max in space just outside the box...there was only one option in Max’s head, and we could all tell what he was thinking!!! He let it fly, with speed, straight into the back on the net. Great goal. Joey back on and Ben off. The next 10 mins were a bit scrappy, with a few shirts being pulled, a few pushes, then a great tackle by Luke that summed up the Falcons’ commitment and fighting spirit. Some more pressure from the TW boys, but our solid defence, who really have been outstanding this season, did not let anything pass. A tough game for all on a hard, bumpy pitch with a gusting wind. Well done to all the boys: two games to go, and with Broad Oak slipping up, four points needed for the Falcons to be sure of being champions again. Or they could just do it in style with a victory in the next match, away to Broad Oak. Good luck boys. The reverse fixture earlier in the season was a very close game, settled by a penalty from Joey. And any doubts that this was going to be a tough match were dispelled when turnng up fully 50 minutes before kick-off to find the Sedlescombe squad already in full training mode. The Falcons set out to make their own impression by taking the practice balls and kicking most of them straight into the river. Clever tactics to lull the opposition into a false sense of security. The Falcons’ preparations then took a further knock when Kaan’s dodgy knees gave out in the warm-up. Referee Jorge toot tooted for the start of the match as Thomas the Tank Engine steamed past, and the Falcons immediately got on track, knocking the ball around well with the gusting wind at their backs. After seven tight minutes, a well-hit through ball from Max eluded the keeper, leaving Joey a tap in. The Falcons deserved their lead, and Joey came close to a second after a lovely run. Sedlescombe looked dangerous on the break, but the rearranged Kaan-less defence coped well with any threats, with Dan C sweeping up well behind them. Clear chances were in short supply at both ends. Max came close with a long-range strike, but instead of hitting the back of the net, the ball became another victim of the river. Then Luke almost caught the keeper off his line from just inside the Sedlescombe half, but the ball floated just wide. Half time - a very tight half. The Jaffa cakes were well-deserved. The second half was toot tooted into life just as the wind began to gust up again, meaning the Falcons would be defending their 1-0 lead against a strong breeze. A couple of minutes in, another fine strike from Max sailed just wide. Sedlescombe began to step the pressure up, but the Falcons resisted well, relying on their passing game to retain possession. Luke seemed to be everywhere on the pitch, breaking up play and winning tackles, while on the flanks the combinations of Harry and Dan B on the left and Luca and Josh on the right were very solid. In central defence, Lewie and Harvey were rocks. Big hard rocks. With legs. About 15 mins in, a nice ball from Max found Ben just inside the box, and Ben displayed his technique to send a beautiful strike into the bottom right corner of the net. 2-0 to the Falcons, and a little breathing space. But Sedlescombe immediately went to three at the back and started to press forward, crowding the midfield and launching waves of wind-assisted attacks. A few minutes later a well-hit Sedlescombe shot seemed destined for the corner of the net, only for Dan C to launch himself full stretch to his right to tip the ball onto the post and out; a fine save that was vital in stopping the opposition's momentum building. At the other end, a breakaway shot from Ben was saved and rolled agonisingly towards the goal, only to be put out just before Joey could tap it in. George and Louis came off the bench to shore up the team well. The Falcons showed great character to see out the rest of the match and secure a vital win against a very useful side. Full-time - 2-0 to the Falcons. Much relief and a job very well done. The Falcons’ record is played 17, won 16, lost 1. And very impressively, 80 goals for and only 6 against (13 clean sheets in 17 matches). So three matches to go and the league is between the Falcons and Broad Oak; three more wins and the Falcons will be champions again. Good luck boys. Having arrived early, I thought it would be worth exploring the the Grosvenor and Hilbert Park. A place I never knew existed, in the centre of Tunbridge Wells. Did you know that it was TW’s first public park, which was opened in 1889 on the site of the former Calverley Water Works, having been engineered by William Hilbert, and still contains the original “Dripping Wells”? So my cunning plan failed! Emerging from the undergrowth just as the match started I thought I was safe. However, Mr Conn was waiting to pounce for that dreaded match report volunteer. Even though I had been the designated driver for Saturday night and was frustratingly hangover free, I had to do a couple of recounts on the subs – was it really five! So could the Falcons repeat the previous 7-0 defeat of the red team? It certainly looked like they might as the Falcons descended onto the red goal (although strangely their goalie is green) during the first 30 seconds, with Ben taking a shot that wasn't to be but at least got the opponents unnerved from the very start. Lewie kicked the ball straight into a red hand, creating the first free-kick opportunity; again the goal just didn't follow. Both teams started to make full use of the pitch, the trees, the long embankment down towards the lake until finally it was decided that the ball was actually flat! This was all in the first 12 minutes! Play resumed and the Falcons spent their time making the red (or green!) goalie work hard. At 10:56 precisely (I was only checking in the hope it was half time), there was a free-kick after a foul on Harry. The boys kept calm but again another goal opportunity eluded their efforts. Perhaps the players were getting bored as they decided to alter all the throw-in rules. Lewie fired one ball onto the pitch like a low level Exocet missile, scattering players in its wake. In the second half most of the action was again at the opponents end, with many of the Falcons trying their luck, Lewie ignored all calls of “pass the ball” and travelled the full pitch to take a shot. Josh took a great shot but was thwarted by a spectacular save. Luke, Max and George all were in the thick of it at the goal but still the ball wouldn't go into the net. The reds decided that they had had enough and went on the attack to be deftly blocked by Dan. At last the Falcons' second goal came thanks to a skilful shot from Luca. Apart from that, the second half was a bit repetitive with the only real excitement being the ball landing halfway up a tree and a bit of a rumpus at the far side of the pitch when Mark called a foul while frantically waving his linesman's flag. There was a definite case of déjà vu last weekend as the Falcons took to the field against a team in blue at the Racecourse Ground. This time their opponents where bottom of the table side Tonbridge Junior Tempest. After a week of intensive treatment on a toenail injury and with a fresh plaster applied by his mum, Harvey declared himself fit and the Falcons were able to name an unchanged squad. Langton kicked off, starting brightly they dominated possession. Full of confidence they “shifted” the ball quickly from left to right, firmly entrenching themselves in the oppositions half. Tonbridge were in for a torrid morning....... and so it proved. Three minutes in, George found some space on the right and delivered a pinpoint cross for Joey to fire home from close range. Moments later the league’s top scorer was at it again; this time from eight yards out, planting the ball into the bottom corner after being played in by his striking partner Ben ...... Joey doesn’t miss from there. The boys had their “game heads” firmly on, Max and Luke bossing the midfield, George and Harry looking dangerous on the wings. A quick short corner from Harry saw Lewie in space on the left, weaving into the box past two defenders he squeezed the ball into the net, 3:0 ..... “Lewie only scores great goals” Josh pointed out. Credit to Tonbridge, they tried hard to get a foothold in the game but any attempt to do so was met by Harvey and Kaan. The two of them working in tandem to snuff out any sign of danger, continuing their magnificent form at the heart of the Falcons defence. When eventually a Tonbridge forward found some space inside the Langton area, Dan reacted quickly, saving bravely at the feet of the attacker. It was going to take something special to prevent him from keeping his 10th clean sheet of the season. At the other end Joey turned provider as he played lovely ball into Ben, who looked up and with one touch lofted the ball over the advancing goal keeper to make it 4:0. Luca immediately picked up the pace of the game and continued his recent goal-scoring form with two goals in the space of ten minutes. The first a precise finish from six yards. The second, an unstoppable shot into the top left-hand corner following a great pass from Luke. It could, perhaps should, have been more; if not for some fine work by the Tempest goalkeeper and the intervention of the crossbar, it would have been. Half time, 6:0, game won, Jaffa Cakes all round. A little more tinkering, Max on for Ben, Dan (B) on for Lewie (C) and the second-half began. Picking up from the first half The Falcons enjoyed the majority of possession. Both full backs, Dan (B) and Louis (V), tested the goalkeeper as they looked to get forward at every opportunity. With Langton fully in control, the intensity of the game dropped, the only outstanding issue being who completed their hat-trick first. The answer came midway through the half when Luca smashed in a volley from close range following another great cross from George. His third goal of the game, his first hat-trick for the club. Not to be outdone, Joey completed his hat-trick ten minutes later when he latched onto a through ball from Max. Outpacing three defenders, he calmly placed the ball past the keeper to make it 8:0. One final round of substitutions, Ben for Harry and Lewie for Harvey, and it was job done. In summary, this was a game the Falcons expected to win and did so quite comfortably with a very controlled and mature performance. There will be tougher challenges ahead, most notably from Broad Oak and Sedlescombe, although the boys remain well placed to retain their title. A chilly morning at the Racecourse Ground in Tonbridge saw the Falcons looking to extend their lead at the top of the table, and bounce back after the narrow cup defeat last time out. Their opponents lay second from bottom of the table, but according to their manager had their strongest team out…so the Falcons were warned to take nothing for granted. From the start, with the wind at their backs, the Falcons started to pass the ball around nicely and dominate possession. Lewie and Harry enjoyed space down the left flank, as Dan and Luca rampaged down the right. And after 5 minutes, the Falcons deservedly took the lead through a typically clinical finish from Joey. More possession followed. Max and Luke were bossing the midfield, with Luke winning every ball going and Max spraying around some delicious passes to keep the Storm on the back foot. It looked only a matter of time before more goals came, and sure enough arch poacher Ben notched up two opportunistic goals, and Luca provided a sumptuous finish to a flowing move. Half-time came with the Falcons enjoying a 4-0 lead. The Jaffa cakes tasted sweet. George and Louis came off the bench for Luke and Lewie, and both slotted in effortlessly as the Falcons continued knocking the ball around well against a spirited Storm side. Lewie’s shock at actually being on the touchline for a change was short-lived, as a few minutes into the half Harvey had to limp off with a nasty toenail-based injury. We wish him a speedy recovery - our thoughts are with him. The Falcons continued to have the bulk of possession, with rare Storm attacks being repelled suavely by Mr Sweeper himself, aka Kaan. Dan in goal was enjoying (?) a quiet morning on the way to his ninth clean sheet in 13 league matches. In the centre, Max was having an exceptional game, switching play with some lovely passing. More goals looked likely, and as the half wore on Ben eagerly grabbed his hat-trick with another well poached finish, Luca nabbed his second, and Ben finished the scoring with the best goal of the bunch, his fourth. Ben deserved the match ball, but unfortunately none could be spared after three had ended up in the river. The final whistle came…. a job well done with a 7-0 win for the Falcons, who retain their place at the top of the table with seven games to play. What a fantastic game, with both teams giving it their all in difficult conditions. Well played Langton Green and well played Wadhurst!! I think most parents were hoping that the pitch would be unplayable and we could stay warm and dry inside. However, checking our emails multiple times didn’t help and we waited on the side-lines in the cold wet drizzle. Still, after last week’s league game, we were confident hopeful of yet another Langton Green victory against Wadhurst at Groombridge. Things started well and in what seemed like an action replay of last week, Harry delivered yet another pinpoint corner, which Max expertly headed home. Wadhurst responded and surged forward. They looked dangerous, but the Falcons have a great defence and Lewie, Harvey, Dan and Kaan held firm, with Lewie in particular making some crunching tackles. However, Wadhurst were clearly fired up after last week and eventually they managed to grab an equaliser. The game was end to end and really exciting (and nerve racking) to watch. Then came a breakthrough, with Joey superbly pouncing on a loose ball, bursting through the defence and calmly slotting home to restore a well-deserved lead for the Falcons. This was how it stayed until half time and the boys could take a well earned breather. The second half kicked off and Wadhurst were on the all-out attack for an equaliser. The Falcons dug in and defended resiliently, but in the end the equaliser came and things were all square again. It really was a great game and there was so little between the teams. This really could have gone either way. Then, following a cleared corner, came a great volleyed goal from Wadhurst. It really was a screamer and completely unstoppable. Could the Falcons come back from this? Of course they could – they’re made of strong stuff in Langton Green. Everyone rolled up their sleeves and got stuck in. With the minutes ticking down, came one last attack. Ben created havoc in the Wadhurst defence and the ball spilled loose to Josh, who slotted home to much relief and cheers from the supporters. Shortly after, the final whistle went and we were into extra time. In the first half of extra time the Falcons pressed forward, on the front foot after the last goal. Then a chance came to Max. He hit it well but unfortunately a defender managed to block it. So close!! The first half of extra time finished and there was still nothing between the teams, it really was so close. In the second half of extra time, Wadhurst won a corner and this time it was their turn to score a headed goal. Still the Falcons refused to give in and this time a great ball found Luca in space on the right side of the penalty area. He’s such a deadly finisher that we all expected to see the ball in the back of the net for 4-4. It was so close, but the ball just whistled past the far post and even Ben arriving at a hundred miles an hour couldn’t turn it in. Wadhurst did get a late 5th goal on a breakaway as Langton pushed forward seeking an equaliser, but by then it was all over. The Falcons were magnificent, but even they couldn’t quite pull it off today. So congratulations to Wadhurst and good luck for the final. Hopeful the Falcons can now complete their, so far, brilliant defence of the league title. PS I haven’t named everyone, but I’m sure all the parents agree that the boys should hold their heads up high after a skilful and gritty performance. Everyone played well and they continue to play as a team, working hard for each other. Well done!! A final mention for the referee, who kept the game flowing and did an excellent job!! On a bright sunny morning at the well-groomed Groombridge home ground, there were defiantly high levels of nerves, and these were just from the parents!! This game was always going to be a high profile and tense game, and it didn’t disappoint! The game started with a lot of pressure from both teams, and for the first 5 minutes it really was end-to-end stuff. There was great passing from both teams and the Langton midfield were really holding the centre of play well. The Langton defence were on the ball and stopping everything that came their way, with some great sliding tackles from Harvey. The Langton boys were looking the stronger team in the first 10 minutes, with great runs down the wing from Josh and Harry. This was soon turned around and we were back in our own half and with a bit of kerfuffle, Wadhurst were awarded a free kick just outside the box! Free kick taken and wide. The ball was out quickly from Dan and a rapid run down the wing from Harry managed to get Langton a corner. Harry to take, great in-swinging corner, and who was there to get on the end of it… Max flying in, up so high, managed to get a lovely head on the ball and guided it into the back of the net. GOAL. The pressure was soon back in the Langton half, and only a couple of minutes after the restart Wadhurst took advantage of a sleepy defence, shot was taken, and firmly hit the crossbar. This was still a very close game. Some more pressure from the Langton midfield saw Harry connect with Joey to pass back to Max, another shot, but this time on his left, clearly not his strongest foot and slightly off target. Wadhurst called to replace an injured linesman. The pace of the game was clearly too much for some. Again back into our own area and Wadhurst were piling on the pressure, but this time it was Luke to the rescue, with some great defending and pace to get back to the danger zone. Some more tenacious work from the midfield saw some great passing up to Joey, who had his first clear shot on target….saved by the keeper, but only into the path of a lurking Ben, who struck it into the bottom corner. GOAL. Nooooooooo. Disallowed for offside. After the team talk, or whatever goes on in the changing room at half time - we will never know - the Langton boys came out fighting! The pressure was on from Langton and after 5 minutes another great shot from Max was just wide. The ball out from Wadhurst was picked up by Luca, who passed sweetly to Ben, who had a shot, straight to the keeper this time. Out again, and again intercepted by Langton and soon up and out for a corner. Another great corner kick from Harry, collected by Ben, who executed a great turn to give himself space...and a shot arrowed into the bottom corner of the net. GOAL. The kick off was quick, again the Langton midfield did a great job in passing the ball upstream. The ball came back to Max, who found himself in loads of space 20 yards out. So why not hit it!!!!! Long shot and in. GOAL. A few minutes of concentration loss from the Langton boys and suddenly the Wadhurst boys were in the box, and a shot came back off the post! Pressure back on from Langton, which saw a shot from Josh just wide, more great play from Luke and another shot from Max, again just wide. Great passing from all the Langton boys, which was a pleasure to watch, saw Luca make a great run down the line. He picked out Max, again in space outside the box….another great strike into the back of the net. GOAL. Great game by all, and the hunger of the Langton boys for a win was obvious throughout. Let’s hope for another great game (and similar result…) next week. A mild, sunny winter morning saw the Falcons take on a Broad Oak team boasting the only unbeaten record in the division. So a tough task to extend the record of having won every game played at Fortress Groombridge, which before the match stood at 11 games this season and last. From the start it was clear that this was going to be a very competitive game, with each side putting some fluent passing moves together. As the match settled, the Falcons began to enjoy the majority of possession, with Luke and Max imposing themselves in central midfield, but Broad Oak always looking dangerous on the break. Luca and Harry were attacking well down the flanks, and both Ben and Joey were taking chances to have a run at the imposing Broad Oak centre backs. At the other end, the back four of Josh, Lewie, Harvey and Dan B were soaking up whatever pressure came their way, with Dan C having to come out decisively to thwart the Broad Oak centre forward when the defence was breached. After 25 very tight minutes, Max won the ball in midfield and fed Joey, whose firm strike was diverted expertly into the corner of the net by poacher supreme Ben. 1-0 to the Falcons. Three minutes later, Josh and Joey combined well to win a corner. Harry, who had passed a late fitness test on his badly gashed shin, curled in a lovely left-footed ball from the right corner. The ball evaded everyone...and the linesman's flag went up to signal the ball had crossed the line. 2-0 to the Falcons. The Falcons now had a firm grip on the game, and were determined to consolidate their lead. A couple of minutes before the end of the half, Josh picked up the ball from right back and launched a lovely long pass into the danger zone. Ben latched onto the ball and hit a crisp shot towards the bottom left corner. The ball hit the inside of the post, and the keeper was just unable to keep it out. Again the linesman's flag went up to signal that the ball had crossed the line. So a deserved 3-0 lead for the Falcons at half-time, but the game far from won as Broad Oak still offered an clear threat on the break. The half-time Jaffa cakes were accompanied by a warning that the opposition would come out hard in the second half...and so it proved. Broad Oak upped their game and started to dominate possession, but the Falcons again demonstrated their character with some firm tackles and last-ditch defending, particularly through strong interventions from Harvey and Lewie. Luke showed his phenomenal fitness by covering the back four superbly when danger threatened, and in goal Dan dealt calmly with everything that came his way. After 10 minutes on the back foot, the Falcons began to regain a grip on the match, with Max in particular spraying some lovely passes around. Joey had a good shot well saved, Ben threatened and Luke displayed his talent for the rabona. Then after 15 minutes of the half, the Falcons broke quickly down the right. Josh fed Luca, who showed a devastating turn of speed to outpace the defence before whipping in a pinpoint cross to the back post. Joey improvised brilliantly to divert the ball back past the keeper off the side of his chest. A great breakaway goal, and a 4-0 cushion for the Falcons. The match continued to be tight, with both sides playing some good football. George and Louis came off the bench and slotted in well as the Falcons tried to calm the match down. Then after 25 minutes, Luca set off on another incisive run, again outpacing the defence and this time striking a lovely shot into the top right corner of the net to make the score 5-0. In all, a display of typical character from the Falcons to turn a very tight match into an ultimately comfortable win. Particularly pleasing was a clean sheet against a determined and dangerous Broad Oak side. So the Falcons go into the Christmas break sitting proudly atop the table with a record of played 11, won 10, lost one. The fact that the boys have scored 57 goals in 11 games while only conceding six shows clearly what a great team effort it has been so far. Still a long way to go to retain the title, but the boys should be very proud what they’ve achieved so far and enjoy their Christmas turkey (not too much pudding though….January starts with two crunch matches vs Wadhurst). Weather: Sunny autumnal day and not as cold as at Ridgewaye three weeks ago! The match kicked off and it was clear from the start that it would be an open, attacking and entertaining game. TWF were set up to hit back on the break and began to soak up the early pressure from LGF. On the first real LGF attack it became clear that Luke had been watching Max Whitlock at the Olympics, as he performed a perfect flying somersault over their keeper. LGF continued to attack and TWF looked dangerous on the break, with last ditch challenges from Kaan, Lewie, Dan and Harvey keeping their strikers from getting a shot away. Then came a chance for me to use the first borrowed phrase - “Joey scores. Memorable!”. 17 goals for the season already!! After the kick-off the pattern resumed, with LGF attacking and TWF counter-attacking. One of the many goalmouth scrambles eventually fell to Harry on his RIGHT foot. If only it had been his left L He swung his right and made a perfect contact! The ball screamed into the net. Fantastic goal and 2-0. The next goal saw Ben ghost in, take the ball between goalkeeper and defender and walk it into the net. Half-time came shortly after and at 3-0 the LGF parents were feeling relaxed and confident of another comfortable victory. How things changed in the second half! First their striker outmuscled and just outpaced our defence to make it 3-1. Then TWF scored a brilliant free kick, curling it into the top left corner and giving Dan no chance. Now it was 3-2, the air of confidence among the supporters had been replaced by a feeling of nervousness. Still, we needn’t have worried. A good pacey attack led to the ref giving a clear penalty. Joey stepped up for his 18th of the season, but things did not go to plan – their keeper saved it! Quick as a flash Joey was there for the follow-up, but somehow the ball hit the bar and bounced out – unlucky!! While TWF continued to look dangerous, the LGF boys stepped it up a notch, with Lewie stepping into central defence, Max fighting hard in midfield, Josh marauding down the wing and everyone else giving it their all. Then Luke ran on to a throw on from George and flicked it over his head into the box. The ball ricocheted around and came off a defender’s hand to fall at Luke’s feet, and he calmly slotted the ball past the keeper to restore a two-goal cushion. Then came the best goal of the game, with Ben using his strength to knock their midfielder off the ball near the halfway line, then using a quote from the last match, “Ben carried the ball from the halfway point, past the TWF defence, to cleanly slot it into the back of the net - chuffed dad!”. Absolute quality again and we all breathed a sigh of relief. A fine performance was capped by Luca scoring to make it 6-2. One goal more for each team than three weeks ago. A good result against a competitive team. Today the Falcons were definitely flying in the right wind direction! It was a very cold and extremely windy morning, and what looked like a very small amount of supporters on the side-line? Until the moment before kick-off, then the other half of supporters emerged from their cars!! Good thinking I say, they looked a lot warmer than a few of us. The Falcons started how they meant to go on; the boys were all ready to go from the start. Our possession was fantastic, the midfield had great ball possession and their passing was a joy to watch. Josh Berry and Harry were having a fantastic game with some great runs down the wings. Great cross from Josh into Max, whose firm shot was saved by the Hawkhurst keeper. The ball was soon back into the Hawkhurst box, lovely run from Ben and a nice cross to a floating Max...shot! But again saved by the keeper. Will this keeper let anything in today? Can we break him? Yes we can! Some great passing and some more of that Falcon magic, and with a loose ball out to Luke there was no way he was going to let this chance go. That’s it, the Falcons were on the attack. Josh was still making some marvellous runs down the wing, this time a great pass over to Joey, fell just perfectly to his feet, but with pace. Joey couldn’t quite get on the end of this one and it went just wide. I now feel as if I am repeating myself!! But what a great run from Josh, past three people down the line and a great cross, which travelled perfectly into the box. Who was there in the perfect position waiting for the finish? Dan Baker, great finish into the bottom-left corner. The midfield were having a great game, Max holding the ball up really well and some sharp passes through to Luke. Then a lovely pass from Luke to Ollie, who slotted another great goal home. More pressure now coming from the Falcons and more long-range shots starting to appear. The confidence was starting to pick up now. More pressure on the Hawkhurst defence and another great shot from Ollie only went wide of the top right-hand corner by a couple of inches. The Jaffa Cakes are obviously a great half-time treat as the boys came out again fighting again and with an advantage as they were now playing with the hurricane force winds. Even Dan stood a chance of a goal from his own goal mouth! It didn’t take long before the Falcons were back into pressure mode, and a great strike from Max rebounded to the feet of George. It has to be…… yes it was, in the back of the net. Hold on, this isn’t right???? Suddenly the Falcons were under attack from the Hawkhurst strikers. A free-kick led to a couple of loose balls, which suddenly led to Dan being faced with a one-on-one with their striker!!!!! Never fear, a very relaxed Dan came out with a great save. We didn’t want to give a goal away now!! After a short period of relaxation on the side, Josh Berry was back on and again a lovely run down the wing led to a great pass to Joey, who found the top-right corner with a controlled strike. The Falcons were enjoying some great possession, and the combination of passes from defence to midfield was really working well. The team as a whole were combining well, with slick movement up the pitch. With space on the ball, Josh decided it was his turn now; a great strike and a lovely kiss off the left post saw it in for number 6 - great goal. More pressure from the Falcons now saw Luke travel the length of the pitch within a few seconds and hit a lovely strike from outside the box…… not to be as it rattled the crossbar. The Hawkhurst defence made a great effort to get it back out. This didn’t last long as Luke picked up the ball from the same spot outside the box and hit another great shot. This time it was meant to be - he had already had a practice shot, so this one was perfect and hit the back of the net. Great game to watch with some fantastic game play and movement from every player on the pitch under some really cold and windy conditions. Well done boys, you deserved that win today. After a bye and a win, the Falcons faced a cup quarter-final against Tonbridge Junior Storm on a crisp, sunny afternoon in Tonbridge. The Storm lay bottom of the division with no points to date, but the cup is a different beast and the Falcons were anticipating a tough game. With Luke missing for the week, Lewie Cameron took on the captaincy and impressed immediately by collecting the team's registration cards after the 'respect handshake'. Top-quality admin (Luke take note...). Sadly there wasn't much quality on show on the pitch, as both teams seemed unable to keep possession of the ball. After a scrappy 10 minutes, the Falcons began to put a few passes together. Ben picked up a ball outside the Storm's box, ghosted effortlessly past a couple of defenders in his usual way, and smacked a firm short into the top corner. Another great goal to add to Ben's tally for the season. The Falcons settled a bit, but were still struggling to get their usual passing game going against a spirited Storm side. Max tried a couple of decent long-range shots, and Lewie was gaining the upper hand in his new midfield role. Joey and Harry had shots well saved by the keeper. Harry and Luca started finding some space on the flanks, and put some decent crosses in. Then a nice move down the right saw Luca find Max on the edge of the box, and after his earlier sighters, this time Max's firm strike found the bottom corner of the net. Despite being 2-0 up, the Falcons were still not at their fluent best, although Kaan and Harvey were comfortably dealing with everything that came their way, and Dan was untroubled in goal (except for a loose boot in the shin from the Storm's centre forward). Then five minutes before the break, Max won the ball about 20 yards from the Storm goal and hit a beautiful shot into the top corner of the net - his second great strike of the half. 3-0 at half-time, and the perfect chance to experiment with a new formation (courtesy of a two to one majority decision by the management team....who take collective responsibility for all decisions made...). So, 3-5-2 it was. The extra man in midfield gained the Falcons a bit more possession, but at the expense of greater vulnerability at the back against a couple of pacy counter-attacking forwards. After about 15 minutes, a vicious shot from a Storm forward took a devastating bounce off a mighty molehill on the six-yard line, leaving Dan no chance (you owe me Dan...). So 3-1 and the Falcons were suddenly on the back foot, not helped moments later when Kaan got clattered and had to limp off. Experiment over, back to a 4-4-2, and the Falcons began to settle down again and start shifting the ball. Some rampaging runs from the impressive fullbacks Dan and Louis energised the team, one such run culminating in Dan almost snapping the Storm crossbar with a thumping shot. Meanwhile, George was getting some joy on the right wing and had a shot well saved by the keeper. Some more good Falcons pressure caused a mix-up between the Storm's centre-back and keeper, and Joey took his chance to slot calmly into an empty net. 4-1 and the Falcons were comfortable. There was still time for Josh to slide a beautifully weighted, defence-splitting pass through for Joey to run onto and finish clinically into the bottom corner to make it 5-1. All in all, not one of the Falcons' best performances of the season, but job done and a semi-final against Wadhurst or Tunbridge Wells Youth Eagles to look forward to. Well done boys....it's the sign of a good team to win comfortably when not at its best. Weather: Sunny autumnal day but damn cold! What do you call a large group of Falcons? A cast apparently. Having arrived promptly for once, there was a noticeable lack of the usual cast members amongst the LGF parental support. My reward, to be offered the choice of ‘flag or pen’ by a rather forceful Mr. Berry. With kick-off moments away, it was assumed that a meaningful tutorial on the offside rule was not on offer. I therefore opted for the latter, despite having only a tatty farm shop receipt to write on. With a limited pool and sideline jobs delegated, TWF won the toss to kick off promptly at 10.00am to a noticeable swelling of the LGF support. The cast on the pitch seemed evenly matched, with equally shouty management and play evenly distributed at either end of the pitch. Suddenly a good cross from Lewie, met by Joey and collected by Josh who tapped it into the goal. A pleasing start, but no time to ease off the pace for TWF soon rallied with a spirited charge led by an impressive wheeler dealing no.7 called Lovejoy. A cheeky but skilful back flip over the heads of our defence and onto Dan, thankfully a sliding tackle from Harvey found its mark. It wasn’t long before our defences were again tested. A heart in the mouth scramble in our goal mouth led to an inevitable equaliser. Another penetrating cross to Joey to Ben to Josh, this time frustrated by some physical TWF defence. Physicality not a problem for the referee, however Harry was pulled up on being offside; TWF free kick, LGF defence holds. Well timed half-time whistle from the referee. Time to cool off before it all inevitably kicks off again. Within the first two minutes - whilst I was working out the above, I was told that Ben had carried the ball from the halfway point, past the TWF defence, to cleanly slot it into the back of the net - chuffed dad! No time to reflect, LGF were back onto the TWF defence. A solid kick from an upfront Max found its mark to subtle words of encouragement from Mr. Campbell who was keeping his own company at a well-placed end of the pitch. Writing space now severely diminished. Surely, that would not be a problem. General consensus from the sidelines (from those who had witnessed the start of the game) was that such an outcome would not have been predictable. Back onto the main cast members…George is onto the ball, strikes just wide of the goal. TWF appear undaunted, however our Captain Luke comes in for some rough challenges as he tries to find an opening among the ranks of TWFs. No whistle to interrupt play until Harry is pulled up – offside apparently. Credit to the Tunbridge Wells Falcons, who kept their spirits up and played well to the end. Note to self, bring a bigger bit of paper next time, especially if I am going to arrive in good time, or as suggested by my son - use my phone – genius! I don’t normally get emotionally involved in games, but when Ben knocked in the equaliser on Sunday I did cheer loudly. The game was competitive, fast, end to end and therefore very tense throughout – most enjoyable. Langton started strongly, and with Joey hitting the bar in the first few minutes, the Falcons looked to be establishing control. And indeed the half continued pretty much in that fashion – dominant in midfield and with well-constructed moves down each flank. There was clever interplay from Josh on one side and Harry on the other side that led to a number of opportunities – if not clear-cut chances. Ben got on the end of several through balls, Max had several attempts from distance, Luke was everywhere in midfield - and we even managed to turn their defence on occasions. And at the other end the defence generally snubbed out any Wadhurst threat – indeed they were limited in the first half to a sliced shot that rolled against the post. Half-time – nil-nil. Jaffa cakes all round. In the second half, the game opened up a little bit more, and goals were always likely to follow. Unfortunately the first one did not go our way – a Wadhurst free kick on the edge of the box led to an unfortunate ricochet, which fell to their striker 10 yards out who tucked the ball away. But the response to being one down was excellent. The Falcons piled on the pressure once again and an equaliser came with about 10 minutes to go. Max won the ball in midfield and made a strong diagonal run before slotting a very clever reverse ball into Ben’s path. Ben opened up his body nicely and placed the shot expertly first time into the top right-hand corner of the goal. The game could have then petered out into a draw, but to their credit both teams kept attacking, and there were further chances at either end. Dan made a cracking save with the Wadhurst centre forward through on goal – and Langton had a shot deflected onto the post. As we pushed forward looking for a winning goal, Wadhurst embarked on one of their few break-away attacks - and following a range of superb blocks, and last ditch tackles, the ball rolled out to an opponent who struck the ball very well from the edge of the box into the bottom left-hand corner. Sadly there wasn’t really time to respond and the final whistle blew. Full time – one – two. I think we all knew this was going to be a tough game and the boys responded really well. Had I written down the statistics on shots, shots on target, possession, passes, tackles etc., I think we would have come out on top – only the goals tally went against us. There were many flashes of real quality, including a superb turn from Louis V in his own half, signs of individual confidence. I think the Falcons will have learned a great deal from this game – significantly that they can compete physically with any side in this league. Turn the dominance in possession into quality chances and the boys should prevail in the return fixture. I totally concur with Simon’s Sermon (the Monday morning edition) – only he needs to preach from the "correct" side of the pulpit !! Falcons back on home turf condemning the Clarets to a 7-0 defeat. Having woken up to hammering rain against the window, we were lucky enough to be rewarded with a pretty much dry game, although there was a fairly strong cross-wind for the boys to contend with. Following last week’s slightly lacklustre display, you could tell the Falcons meant business as soon as the squad arrived, with stretches and precision drill-sets to warm up. The initial few moments of the game were slightly tense, with Ian and Simon’s voices echoing round the pitch as the Falcons took a few minutes to find their feet. It didn’t take long though before the boys were achieving good possession and movement to tee up Joey for an unlucky shot on goal, taken wide by the cross-wind. Foresters also raised their game slightly by counter-attacking, only to be shut down by a clearance from Luke that landed nicely for Ben to have a shot on goal, although just carried wide. ‘That pesky wind’. Surely we were due a goal soon. Another powerful shot on goal by Max. The keeper took no chances and pushed wide for a corner. Foresters were now clearly feeling the pressure, with the Falcons upping their game to a different gear with a continued bombardment of shots and attacking play. Some solid defence from the Falcons meant nothing significant was slipping through, with Kaan, Dan B, Harvey & Lewie locking down any attempts on goal. Only a couple of attempts found their way through, but these were quickly gathered up in the safe hands of Dan C.
Dan B however picked up an injury, so was subbed with Louis V, who came on to fill the right-back slot. The Falcons' attacking mid were really making Foresters work for the ball, with Max, Luke & Ben remaining strong to enable Josh to tap in a loose ball for the Falcons' fourth goal. (4-0) Blimey I should have bought a dictaphone! Anyway, after some great passing and persistence, Luke played a lovely cross to Josh, who sent it home for his ‘hat-trick’ (5-0), and a fitting end to the first half. With the second half now under way, I could see the Falcons' confidence grow with good communication between players and some great marking. Luca made his presence felt and was strong on the ball, as did Louis V, who made a lovely run down the line to finish with a strong cross into the box, which glanced off Harry’s head just wide of the post. Joey was subbed for Josh Brogan, who came on with some fresh legs and soon lined up Luke for a shot from outside the box, which unfortunately got deflected and gathered up by the keeper. Attempts on goal continued with a great cross from George, which just didn’t find a Falcon to swoop in to finish. Lewie was subbed for Joey, who came back on looking for his hat-trick, but in the final few moments it wasn’t to be. Whistle blown, full-time score a very respectable 7-0, and the Falcons’ 16th consecutive league win. Great performance from all the boys, who get a half-term breather next Sunday (along with the coaches), ready for our match vs Wadhurst the following week. Can’t wait! Match reporter: Alastair Cameron – the only person who carelessly didn't avoid Steve's pleading gaze! Looking out from up high, it appeared that there were twice as many Falcons as the nonexistent opposition. Then I realised they were all wearing green and white...surely The Ref wouldn't stand for that? Especially as Mr Organised Peat had already pre-empted this in numerous emails - BRING YOUR YELLOW TOPS. Who reads those emails anyway? You could see The Ref’s despair as there was a half-hearted attempt by Ian to squeeze 11 boys into a meagre collection of 8 yellow shirts. Project abandoned and it was game on with kick off exactly on time to the peel of the church bells. As you will see from the quality of the reporting, there was definitely no confusion who was who as the match ensued. At least Dan was recognisable in goal, a vision in purple. Back to the game. Five minutes in and all the boys in green are in one half – luckily it’s the Rotherfield half and this was rewarded a further two minutes later by someone in green putting the ball in the net. The parents hadn't got a clue who had scored despite avidly watching the game. “It was that boy in the green”, then there were various spurious claims laid to “It was my boy” until finally it was settled by a late-arriving Kerry who had received a text saying it was Ben who had scored! 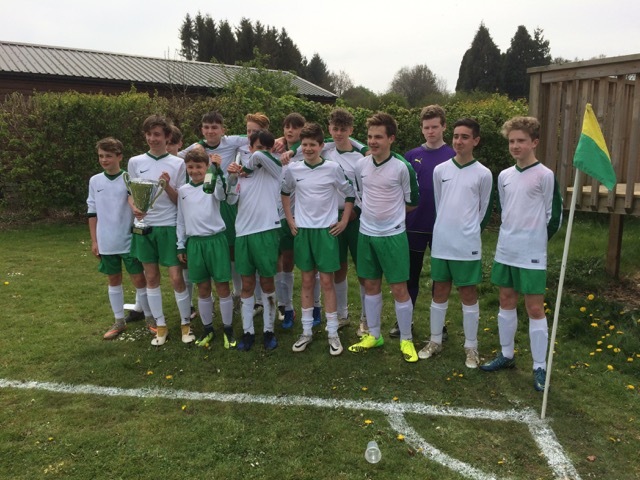 Lots more action followed in the Rotherfield half and the green-on-green challenge was only further confused with Harry P being urged on to score against Harry the Rotherfield goalie – C’mon Harrys! 20 minutes in, Joey placed a goal straight past the keeper to make it 2 - 0. Play seemed to get a bit haphazard after this, lots of shots but none hitting home, the Rotherfield goalie certainly earned his keep. Joey kept the pressure on but still no luck. The team created the perfect opportunity for Ben – it was a goal – just the wrong goal – yet more confusion – there were six sets of goal posts at the opposition’s end. Prize for anyone who knows the collective noun for a group of goal posts! Lots of long shots kept Simon in the woods retrieving lost balls. There was an exciting moment of rugby where Josh Berry threw someone to the ground only for The Falcons to be awarded the free-kick – must be the shirt colours! With a look of determination, Harvey took the kick and there was speculation that it was quite likely that someone from the wall of players facing him would end up in the back of the net clutching the ball. Unfortunately the “low goal” thwarted the forceful shot. A new line-up of Falcons players put forward – lost track of who was subbed for who but as we had five subs it was clear Ian was going to make good use of them by removing the strikers from the pitch. Things didn't improve and there was some fumbling of shots, missed toe punts and our players spending more time down than up. After about 15 minutes of mayhem some further substitutions followed and I can only put this down to satellite delay with the mobile signal and finally the text must have landed! Everything changed and the boys decided they had better win the game decisively. Ben and then Joey were subbed back on, Joey scoring within 30 seconds of being back on the pitch 3 –1. Rotherfield retaliated, only to be stopped in their tracks by a diving save from Dan. Some fabulous passing from Ben to Harry to Joey ended with the score rising to 4 – 1 and the final whistle blew. A good win for the boys but much tougher than may have been expected. Apologies if I missed anything but I can assure you it was definitely the boy in green that did it. Sedlescombe, a pleasant fifty minute drive through rural East Sussex at a the ridiculously unholy time of 08:30am on a Sunday morning. There was plenty of time on arrival to take in the lie of the land: A flat pitch, short grass (it was commented that Simon’s mower settings may need a reset), smaller-than-usual goals and a brazen display of un-faded suntanned legs from Mr. Berry! The tranquillity and banter was rudely interrupted by a call to arms from the shouty referee. Linesmen ordered to promptly present themselves (quick muster from Colin), all boys ordered to show their cards, and for the avoidance of any doubt, notice given that a red card would equate to a three-match ban and a fifty quid fine. With pleasantries out of the way, the match kicked off at 09:50 and not the advertised 10:00. No one seemed up for arguing with this referee. Thankfully Luca arrived minutes afterwards to replace a still convalescing Josh, who joined an injured Kaan and George on the side-lines. An erratic start ensued, which settled into a fast pace that was to be endured throughout the game. A shot from Dan at the Sedlescombe goal in the first ten minutes, a worthy attempt but a miss, followed by a miss from Ben. Sedlescombe responded with a break out of their now besieged half to slot one over the short goal. Good to see Dan our goalie finally getting involved. Joey fouled, Harry free kick…so near. Some flag waving from both sides, Sedlescombe now held to account on a second offside call from the referee (their first may not of stood the rigors of an action replay - over to Colin on that one). Ben then pulled up by the referee for pushing (he was not the first). Some outstanding movement of the ball from Luke, some great blocking from Harvey and solid midfield play kept the Falcons firmly in the game. With the forwards enabled, Ben got to the ball, a well-placed pass to Joey, thwarted by a solid Sedlescombe defence; a pass back to Ben and again thwarted. Sedlescombe answered with a wide shot at our goal. Half-time whistle. An even match, no goals, but it was generally agreed on the side lines that a score of one all would have accurately reflected the effort and pace we had witnessed from both sides. Falcons first on the pitch - obviously keen to get the job done or was it just to stay on the right side of the referee? Falcons kicked off, some prompt forward action to no avail. Max, who had obviously put aside his birthday celebrations, was making his presence felt in the midfield. Some great clearances from Lewie and some decisive input from the shouty referee, who left no one in any doubt of exactly when and where an offence took place. Yet another Falcons attack. This time Joey running with the ball – only to be taken down in the box. The referee was on it and wasted no time in awarding a penalty. Joey takes it, Joey scores. One nil to the Falcons. A notably brave protest from a lone Sedlescombe defender was quickly dealt with by the referee, leading to some very loud encouragement from the very effective Sedlescombe goalie, who was not unreasonably confident that his team could yet turn the game around. Subs from both sides had now been employed, thereby ensuring the pace of the game was undiminished. George wasted no time in getting effectively stuck in. Opportunities continued to be created, but the much-needed goal was proving to be illusive. Breaks from the Sedlescombe forwards continued to test our defence. Some lovely forward play by the Falcons was similarly repulsed. Both goalies were called upon to venture dangerously out of their boxes. The Falcons team chased the ball at every opportunity. A run by Joey was blocked by the Sedlescombe goalie, leading to a tangled mess on the ground, but as soon as play resumed the pressure was back on the home team. This time Max-the Birthday Boy had moved up and seized his chance, only to be unceremoniously tackled in the box. Hand up for a second penalty, but not awarded. No-one argued! By far the Falcons' toughest match of the season to date, with far too many heroic contributions to mention. Every pass, shot, tackle and block contributed to a wonderfully fast-paced, entertaining - but stressful - football match, in which our team’s unbeaten winning streak (now up to 15 consecutive league wins) remains unbroken...just. Just want to start by congratulating the boys on their composure in this week’s game. Again the boys were in good spirits. Even Ben looked bright and lively after a heavy birthday night J. Remembering the score-line from last season’s head to heads with Riverhead, this team were not going to be pushovers. From the kick-off, the boys found this was not going to be a walk in the park and they were going to have to fight if they wanted to keep up the winning streak. Riverhead were straight in and putting the Falcons under quite a lot of pressure. It was end-to-end stuff. We were being tested in the first five minutes with quite a lot of presence in the Falcons' half. But with our strong defence, Riverhead could not break through. We had some great clearances from all the boys in defence and Max dealt well with some potentially deadly crosses. The midfield were really starting to push forward now and 15 minutes into the game we were starting to look the more dominant team. Luke was having a great game in midfield and regularly winning headers in the middle. Then our first break, with a lot of pressure from the Falcons. A wind-assisted goal-kick from Dan caused panic in the Riverhead defence, the defender didn’t see the goalie way off his line, and his attempted back header ended up in the net for an own goal. The pressure didn’t stop there. The Falcons' confidence was up now. The only issues they faced were some shirt-pulling and trips from the Riverhead players. This didn’t stop the Falcons: some great midfield work put a good ball to Lewie, whose shot from just outside the box ended up almost taking the netting out of the top right corner of the goal. Great finish. The pressure from the Falcons kept coming, with some wonderful footwork from Luca. There was a great one-two between Ben and Joey, who were linking really well up-front. Some further long-range shots came from Luke and Max, unfortunately just missing the goal, but still dangerous. A back pass from the Riverhead defence went unnoticed by the ref - to everyone else it was clear - again play on! The second half saw a different type of football. Riverhead seemed to come out like a team possessed! There was a lot of shirt-pulling, kicking out and pushing, which led to two of the Riverhead boys receiving yellow cards. This was end-to-end stuff and a real fight for the boys, as this was definitely the first wake-up call of the season. If the Falcons wanted to win this one, they were going to have to fight for it...almost literally! The Langton boys started to again look dominant, with the midfield really working hard and putting some great through balls into the danger areas. It wasn’t long until Joey managed to get on the right side of a shirt-pulling defender and slot it in for another goal. With a lot more pushing and shoving going on, we were all thinking, when is this going to be over and will all the players come off in one piece... With two minutes to go, Joey was tripped just outside the box. Free kick. A superb shot from Joey. The keeper just managed to get his hands on it, and appeared to fall into the goal just as Dan Baker arrived on the scene following up. Great goal, number 4… But no. The goalie rolled on the floor, and when the ref arrived he gave a free-kick to Riverhead. No goal. What a great result from what was definitely the most physical game the boys have played. Well done to all the boys for keeping themselves composed. Keep doing what you are doing boys and you will go far. That is now 14 consecutive league wins for the Falcons…..well done. Can I just start this report by clarifying that although I live with four football-obsessed males who consume a constant stream of Sky Sports, my football knowledge is limited to kit comparisons and commenting on ridiculous haircuts. Ok, so now that's clear, on we go. The team maintained their unbeaten run on Sunday morning in the sun, on what turned out to be a very warm autumn day - and with the full team available for selection, all the boys played their part and contributed well during the match...lots of 'fresh legs'! The boys collectively, in whatever formation they lined up, looked too good for Hawkhurst. But with a couple of goals ruled out - sportingly, I may add - it wasn't until the latter part of the second half that the superiority resulted in lots of goals for Langton. The match started well though with a goal from Joey after just three minutes - but for the rest of the half, although with lots of rushing around the pitch, mainly at the opponents end, a little bit of pushing, shoving and shirt pulling on all sides (I'm told that's perfectly acceptable), there were no subsequent goals for either team. Indeed, Dan in our goal had to make a superb save in a one-on-one situation to foil the Hawkhurst boys and stop an equaliser. The second half started a little slowly, but the general strength and speed of the Falcons began to show as the game wore on. The goals generally came from constant pressure - the result of Max and Luke winning most battles in the middle, and from the defence snuffing out any opposition attempts to score. In summary - a solid performance from the boys on which to build for tougher games to come. Final score: 8-0 - and another clean sheet. Whilst the the boys look very nice in their white kit, I would like the management to note the difficulty in keeping it so, especially during the winter months !!! A quick "Thanks" to the pitch-side parents who gave me a few pointers in the completion of this report. The score really says it all!! Yet another defensive masterclass and goals coming from five different players. Following last week's great result, this fabulous start to the season is testament to the hard work of the boys and coaches in the pre-season training sessions. Under a beautiful blue sky and in glorious sunshine, the pitch looked in really good condition. Having overcome the road closure, the boys kicked off and the match started at a frenetic pace. Tunbridge Wells Youth (TWY) had the best of the early exchanges and clearly had some pace up-front. There were a few scares, but nothing to overly trouble Dan in goal. The first moment of class came from Lewie Cameron, who invented a new skill, of trapping the ball between his legs and somehow keeping running past the TWY player. The boys were now getting into a rhythm, with Max tackling hard and producing some exquisite passes, Luke surging up and down the pitch, Harry and Josh terrorising the full backs and Ben and Joey a constant threat up front. The defence of Harvey, Kaan, Dan Baker and Lewie had by now resumed where they left off last year with an impenetrable wall in front of Dan. It was one of Max’s super passes that put Joey through on goal and, with normal service resumed, it was 2-0 and looking fairly comfortable. A hat-trick soon followed and Joey was back in the position of top scorer already. 3-0 at half time and smiles all round. The second half was much of the same. Fresh legs were introduced, with Luca, George, Josh Brogan and Louis Verrell slotting straight into their positions. Two similar goals followed in quick succession from Luke, taking his seasons total to four in two games. Both were long shots from outside the box that flew into the top of the net. Then Ben showed his class by accelerating past the defence and cooling slotting home past the keeper. Ben’s pace over those first 10 yards is quite something to behold. He just seems to glide over the ground! So 6-0 and still the boys pushed for more. Luca was proving a real handful up front and was showing really good technique and touch to set up others around him. Luke still had enough energy left to surge down the right wing, and his perfect cross was brilliantly headed into the goal by Harry for a well deserved goal to make it seven. With time running out, Harry produced some fabulous wing work, selling a dummy to the first defender, sprinting round the next defender, nutmegging a third and then finding Luca, who had made a great run and was one on one with the keeper. Luca’s hard work deserved a goal, but the keeper blocked. Luckily George was following up and capped a brilliant day by making it 8-0. Dan in goal had pulled off a few good saves, the defence was solid, the midfield tireless and skilful, and the attackers ruthless and deadly. Editor’s note: This victory was the Falcons’ 12th consecutive league win. That’s a great achievement - well done to the boys. The Falcons went into their first league match of the new season as reigning champions lacking three key players - Josh Berry, Joey and Harvey - because of work permit issues. Opponents Tonbridge Junior Tempest were an unknown quantity for the Falcons, having been promoted as champions of the B division last season. The key question for the Falcons on a warm Sunday morning at Groombridge was whether they could continue their excellent form of last season, with an edge sharpened by a brutal pre-season training schedule overseen by Drill Sergeant Peat. Kitted out in pristine new white and green kit, the Falcons started strongly, dominating possession with sharp passing and good movement. However, despite their possession, the Falcons were struggling to create clear goal-scoring chances. Then, after 12 minutes, the Tempest dared to venture into the Falcons half for pretty much the first time. A Falcons clearance ricocheted straight into the path of the Tempest centre forward, who buried his shot in the bottom corner, giving Dan no chance in goal. Could the Falcons show the character of last season and come back? The answer came within five minutes as more possession left Ben in space, and his precise chip gave the Tempest keeper no chance. The Ghost was off the mark for the season. 1-1. The Falcons kept pressing, moving the ball around the pitch quickly and effectively, with Max in particular pulling the strings with some very intelligent passing. Then after 25 minutes, new, improved, super-physical Luke won the ball outside the box and hit a long, high strike that hit the back of the net before the Tempest keeper could claw it out. After an agonising few seconds, the man in black rightly gave the goal. 2-1. The Falcons were now hitting their stride. The back line of Louis, Lewie, Kaan and Dan B were imperiously snuffing out any threat from the Tempest, and Dan B was an increasing presence marauding down the left wing, linking well with Harry, while Louis and George were proving an effective partnership down the right. Meanwhile, Luke and Max were bossing the midfield, and peppering the Tempest goal. On the half hour, a Tempest attack was broken up, the ball shifted swiftly up front to Luca, playing very effectively in the hole behind Ben. Luca deftly slipped the ball through to Ben just outside the box. Ben took a few quick strides to outpace the Tempest defence, sidestepped the advancing keeper and calmly rolled the ball into the net - a wonderfully accomplished finish. 3-1 at half time, a deserved lead for the Falcons. The second half saw the introduction of Josh Brogan up front, and started in the same pattern as the first, with the Falcons dominating possession. Lewie started to venture forward classily from centre back, like a slightly younger John Stones, while Kaan and Louis calmly swept up anything that came their way. Dan B was a force of nature up and down the left side. Dan C kept himself warm. Play started to get a bit scrappy, with only a few shots from Max troubling the Tempest keeper. Then, after 20 minutes, more Falcons pressure saw the ball fall invitingly for Luke just outside the box, and Luke duly hit a sweet shot straight into the top right-hand corner of the net. Unstoppable. 4-1. Five minutes later a lovely combination between Harry and George saw the ball find Max in space on the edge of the box. Max swept his shot precisely into the bottom corner of the net for a well-deserved goal. 5-1. The Falcons had the game won, but there was time for some icing on the cake. With five minutes to go, Harry slipped a corner short on the left to Dan B, who capped a great performance by arrowing an unstoppable 30-yard shot straight into the top right-hand corner. I say 'shot' advisedly, because it was definitely a shot. Not a cross. A shot. So 6-1 to the Falcons, and that was how it finished. Overall a very satisfactory performance, particularly for the first match of the season. It was nice that the ref complimented the team after the match, particularly on how well they moved the ball. One notable aspect of the game was a new physicality to the Falcons play, with the boys using their upper body strength to consistently win challenges. Very good to see. Also good to see was the usual great support for the Falcons from the sidelines, not least from non-playing Josh, Joey and Harvey, all of whom will be available for selection from next week. There will certainly be tougher games ahead, and the boys must maintain their focus and intensity, but this was a very promising start. The boys should be very pleased with themselves.